The consensus of the largely Republican panel was that conservative Christians, as a political party, has largely been silent as a power block this Fall. Yet 56% of the country still considers themselves conservative, only 27% liberal. The prevailing presumption on CNN today was that Obama was going to win the election. If this happens, does this mark a turning point in American political history? In American religious history? Does this rejection of the George Bush years, equal a rejection of the Christian right? This past summer I attended a fascinating workshop at the World Future Society. Mike Morrell, an emergent Christian leader, and Regent graduate fellow of strategic foresight, hosted a panel on “The Future of the Religious Right,” with guests Brian McLaren, and Dr. Diana Butler Bass. In scenario 1, Contracted, even personalities like Sarah Palin, may find it hard to turn conservative values into a political force come 2012, given changing demographics of Hispanics. In scenario 2, Resurgent, a chastened Christian right, allows the economic and international Republicans to rebuild the Reagan coalition. With luck, prospects for 2012 brighten. In scenario 3, Pregnant, the spiritual center of Evangelicalism shifts from closed to an open set, and joins with post-liberals. They join the New Roosevelts – a new Democratic super majority in a new chapter of spiritual history in America. 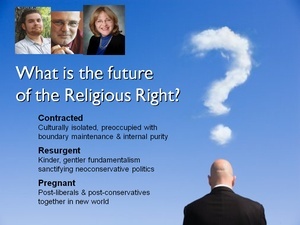 Compare to this past summer, all three of these alternatives seem today alot more possible than the baseline future– or historical trajectory of the Religious Right. Back then, I remember talking to a participant from Focus on the Family immediately afterward about their implausibility. But no more. So where do we find ourselves? Yes, in Christ, we are raised up in heavenly places. But what is the new role of religion in America? Would you like to respond to Jay Gary’s blog? You are welcome to email him, if you offer ChristianFutures.com permission to post your comments. We reserve the right to edit down your statement or not to post them. Please identify yourself, your website/blog, and your city, town. Your email address will not be posted. We welcome contrasting viewpoints.